• We start our tour with Tokyo’s Imperial Palace (Kōkyo, literally “imperial residence”), once called Edo castle (Edo is the old name for Tokyo), residence of the shōgun and currently main residence of the Emperor of Japan. The Palace is still surrounded by the original moat and imposing gates and ancient watchtowers can still be seen along the walls. • It covers a vast area inside a park in the Chiyoda district neat Tokyo station and comprises of numerous buildings including the main palace (Kyuden), the private residences of the Imperial family, an archive, a museum and the administrative offices. • We then enter the park where we can admire the Sakuradamon gate and the Nijyubashi bridge, an elegant two-arch bridge leading to the main entrance. • We move on towards the Kaminarimon (“thunder gate”), an impressive gate which holds the largest red paper lantern* in Japan. The Kaminarimon is the outermost of two large gates leading to the *Sensi-ji temple in Asakusa** dedicated to the Buddhist goddess Kannon, who is very popular in Japan and incarnates compassion. 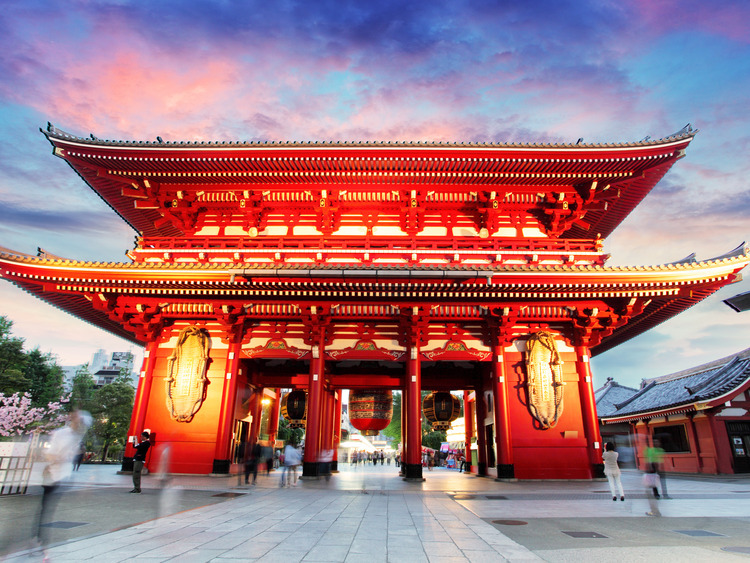 With its millenary history, the Senso-ji temple represents the most important and ancient in the city and is the most popular tourist sight. • The Kaminarimon is flanked by two statues - one represents Fujin, the god of wind, while the other is Raijin, the god of thunder (which gives the gate its name, i.e. “Furaijin-mon”, the “gate of thunder”). These two deities have always been considered the protectors of the temple, still one of the main sights in Tokyo. • The Kaminarimon gate marks the start of the Nakamise-dori street, a 250 metre long road with 89 shops where we can find all kinds of goods: souvenirs, hair accessories, dolls, lucky charms, handicrafts, postcards, sweets and typical food. This ancient market is the perfect place to buy souvenirs and try a few delicious Japanese delicacies. The order of the visits may vary and the coach transfer depends on the itinerary. * We recommend that you book early because only a limited number of places are available. * Heavy traffic jams to be expected due to it being travelling season in Japan. * We recommend having Japanese Yens available as there are no exchange offices in the port. *Clear views subject to weather conditions. * Comfortable walking shoes are recommended.